Who says ceramic knives never get dull? Have you tried to cut bones and frozen foods with a ceramic knife? Misuse will put a chip on the blade. Just like other knives, they do become blunt over time and this is where sharpening comes in. We’ve compiled a list of sharpeners for ceramic knives that are both useful and affordable to help everyone restore dull ceramic knives from the comfort of your home. There are many sharpeners for ceramic knives on the market. Manual sharpening requires skills and time but the electric ceramic knife sharpener can do a good job in under a minute. The battery-powered diamond wheel knife sharpener from Kyocera is the perfect and quick solution for ceramic knives. Click on image to check price and review. Ceramic knives feature a ceramic blade instead of the usual steel blades. They are made from Zirconium dioxide and the blades have a tough edge which manages to maintain sharpness for much longer compared to the steel knives. Apart from their sharpness, the knives are loved because they are not porous and hence do not transfer odors and they are dense hence sanitary. Manual or Electric Sharpeners for Ceramic Knives? Compared to conventional manual sharpeners, electric knife sharpeners sharpen the ceramic knives faster considering they are motorized. This can be advantageous even in high volume settings like restaurants. The other advantage of the electric knife sharpeners is that they do not require any sharpening technique for good results to be enjoyed. You simply plug them in and slide your knife in the slot and you are good to go. They are also very efficient considering that they do not pose any damages to your knife if you use it correctly (make sure you read the user’s guide first). Your knife remains in a good state and stays sharper longer with an electric ceramic knife sharpener. Electric ceramic knife sharpeners are not only suitable for ceramic knives, but can also sharpen other knives with the same precision. They have removed the guesswork when it comes to sharpening knives and as long as you choose the best sharpener you stand to enjoy all the benefits. There are lots of options on the market. By comparing and reviewing a few top best sharpeners for ceramic knives, you shall be getting razor-sharp ceramic knives in no time. The most notable thing about this sharpener is that it is battery powered. But considering that not too much pressure is required to sharpen ceramic blades, this does not interfere with the abilities of the knife sharpener. 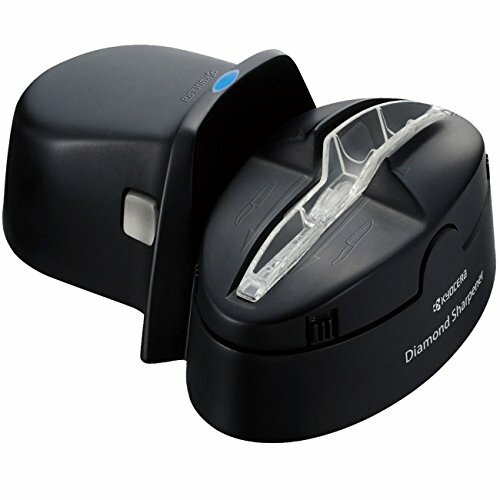 This Kyocera Ceramic Knife Sharpener has more than 300 reviews on Amazon. Kyocera Ceramic Knife Sharpener is intended for sharpening ceramic blades, but it still does a very good job on steel blades as well. The fix-angle of 17-degree (total of 35-degree) is maintained to deliver a razor-sharp edge on both the ceramic and steel knives. It is also designed for left or right-handed use. Click here to check lowest price. Diamond wheel and grinding stone – It makes using the sharpener easy on the ceramic knives and steel knives too. This electric knife sharpener has a diamond grinding stone which takes blades up to 0.5mm. The knife slot is fixed and together with the assist roller, they make sharpening swift. Safety cover – Grinding and dust are completely contained within cover so you enjoy clean safe sharpening every time. The cover eliminates issues with grind particles and also makes it easy for you to empty and clean. 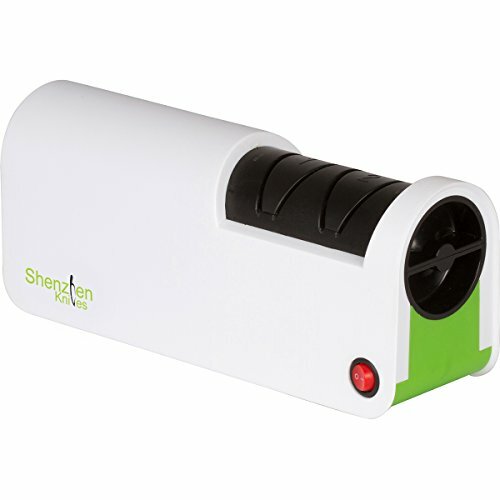 What is most outstanding about this battery powered ceramic knife sharpener is that it is sleek and very easy to use. The grinding stone is designed as a separate unit so cleaning the entire unit is very easy. This also means that you can replace grinding stone easily when it wears off instead of having to buy a new sharpener. Also worth mentioning is that the sharpener comes with clear, concise instructions so using is smooth even for first-time users. This ceramic knife sharpener is compact but comes with enough power to handle ceramic knives and even stainless steel knives. It is designed to offer consistent sharpness levels for your blades from the tip to the handle and at an impressive speed. Shenzhen Knife Sharpener comes with a 2-stage diamond sharpening wheel. Generated more than 200 reviews on Amazon. Click on image to check lowest price and review. Shenzhen knife sharpener has two sharpening settings so you can choose to use coarse or fine depending on what your knife usage needs are. Thanks to the diamond grinding stones, it is capable to grind steel and ceramic knives in a relatively short time. This tool sharpens at 18 to 20-degree angles, hence it may not be very suitable for professional chefs with delicate knives, but then again it is really not intended for that. But it does a very good job for kitchen knives. 2-Stage sharpening process – Using this sharpener you will manage to hone fine edge of your knife in a simple process. If you have a rough blade with visible nicks or rough edges, then you should start on the coarse setting before then polishing it on the fine setting. The 2-stage process ensures smooth, sharp blades no matter how bad the state of your knife. Diamond wheel – The diamond wheel featured on the sharpener maintain precision sharpening all through the blade. The electric powered wheel can remove chips of up to 1mm from your blade for a smooth, sharp knife that you will love to use. The wheel is estimated to last a year depending on the usage so you can be sure to enjoy sharp knives for at least a year without needing a replacement. The fact that the wheel cartridge can be removed for easy cleaning makes the sharpener very convenient for any given setting. It also has a universal knife guide slot that can accommodate most ceramic and steel kitchen knives. With so many electric ceramic knife sharpeners available in the market, it is important to know what matters most so as to select the best. It is only fair that you get a sharpener that serves your sharpening needs effectively and for longer. Below are a few of the important aspects you should consider to find the best electric sharpener. Also read: Electric knife sharpener review to gain a better understanding of the different features and functionalities of the electric knife sharpeners on Amazon. 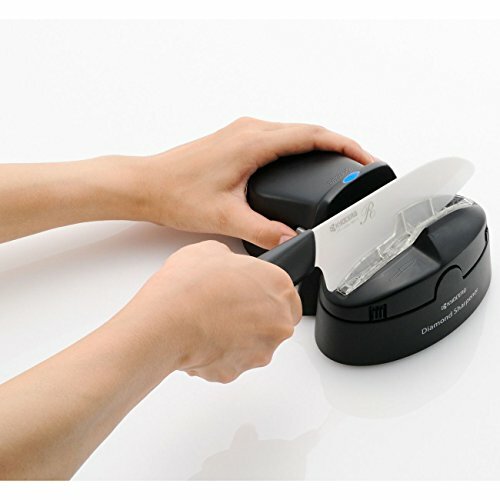 Electric sharpeners that have more than one blade slots for your knives offer multi-step sharpening process. Such is better compared to just single slotted systems because they boost the life of the unit by dealing with bluntness in a simple process. Whether it is a 2-stage or 3-stage sharpener, the sharpening process should be straightforward and require little or no learning curve. A device with two or more stages will usually deliver razor-sharp knives better than a single slot. The multiple-stage also mean that you have an easier time sharpening your knife to the right level. For instance, a knife used for slathering butter need not be too sharp otherwise it becomes a cutting tool. Sharpeners for ceramic knives are designed for ceramic knives, but a sharpener that can also handle steel knives will be more convenient. It is also important to remember that most of the sharpeners are for flat blades. If you want to be in a position to also sharpen ceramic and steel blades, take care that your device can handle them. Not all units are designed equal so ensure that you buy a tool that will handle all knife sharpening needs you have. The angle through which your sharpener works will determine the kinds of results you get on different knives. Kitchen knives require between 17 to 20 degrees. Asian style knives are designed to be 15 degrees. You may consider a sharpener that can handle both angles so you can enjoy fine cut knives even as time passes by. It is best you know about the angle of sharpening before buying your device. But for the electric ceramic knife sharpener, everything is taking care of. Durability is very important, even when buying an electric knife sharpener for your ceramic knives. Units that have diamond abrasives are far more durable considering that diamond is among the hardest minerals on earth. Devices featuring diamond in their design may be a little pricey compared to others, but they are definitely worth it. As for sharpeners for ceramic knives, only diamond abrasives are used. Remember that the sharpening process means dust resides because parts of the blade are shaved off to achieve the sharpness. Consider therefore how the metal or ceramic shards are collected at the unit and whether it is possible to separate the parts for easy thorough cleaning. Design and size of sharpeners are usually a matter of personal preference. Consider where you wish to place the sharpener when looking at size and design. Also, remember that larger units may come with more features compared to compact units. Know your needs clearly, make comparisons and select the device that appeals to you the most. Most people will look for a powerful and compact unit. The Kyocerca knife sharpener is a battery operated device, so it’s portable and compact. Although ceramic is harder than steel, chances are it could easily chip due to the brittleness. Always take special care to maintain edge sharpness and prolong its lifespan. Choose a cutting board that always pair well with ceramic knives to prolong its longevity (edge sharpness). Wooden and plastic cutting boards work best with ceramic knives. Avoid dropping the knives onto the hard floor (tilt). This is the fastest and easiest way to chip the blade. Do not use ceramic knives to cut bones and hard frozen foods. Sharpening a ceramic knife is not difficult if the right tool is used. Since there are various sharpeners for ceramic knives available on Amazon, there is no apparent reason to throw away the ceramic knives when they become dull. So, get ready to restore dull ceramic knives with the help of a ceramic knife sharpener.